Back in the 1970's Honeywell ran a series of adverts, where they'd made animals out of the components in their computers. These weren't today's neat little servers, they were hulking great lumps of metal, full of wire wrap and TTL logic. 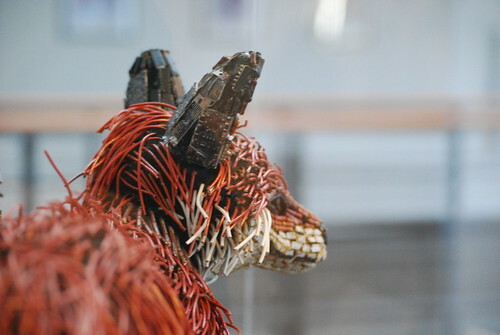 The sculptures used those to their full, with wire fur and component eyes. The Computer History Museum in Mountain View has a few in a case next to their conference facilities, with prints of the photographs from many of the adverts. Six of the famous computer component animals built by Honeywell are on display at the Museum. These six of the more than 100 animals made were "rounded up" by Morris Dettman, who sponsored these sculptures for a Honeywell advertising campaign that ran from 1964 to 1978. Honeywell put together the display of the animals along with an introductory case with illustrations of the ad campaign. 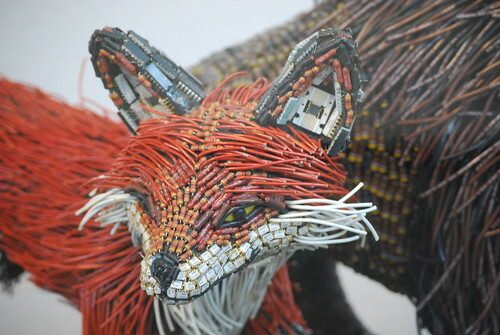 Each animal sculpture was produced from the contemporary computer components of the time. Since about half a dozen sculptors from the Boston area were used, several different types were produced. For the most part, the animals are either sculpted from styrofoam or formed from wire mesh and then the components put on the surface to form an appropriate mosaic. I spent some time trying to photograph the fox through its reflective glass case, and finally managed to beat the mix of fluorescent light and autumn California sun into some sort of submission. They're even more amazing in, err, the flesh. Designed well. Built Well. Honeywell. Some of us have fond memories of supporting Honeywell 66/DPS hardware [running under GCOS3] in the late-1970s. And we know why there is a GCOS field in /etc/passwd on UNIX systems. Re: Designed well. Built Well. Honeywell. Designed Well. Built Well. Bull. That's a damned nice piece of work. Thanks for sharing your phooties! Hah! Now you remind my my uncle used to work for Honeywell. They also had some desktop sized castings of some of these, I recall he had a fist sized eagle paperweight. You should have asked johnnyeponymous if he might have been able to open the case or otherwise get them in a place where the photo conditions were better.